Thanks to VectorPlexus for his amazing work on the male spriggan meshes! Would like to thank Jared Bangerter and his excellent tutorial on making transformation spells. I've personally never modded before but his teachings have proven to be really helpful. He's also the author of the mod Master Shapeshifter which is available on the Nexus. Big thanks to Muppetpuppet for publishing the sabre tiger texture as a mod resource (Texture used in the trailer video). He is also responsible for one of the best quest mods out there - The Moonpath to Elsweyr. The aspect of nature now uses the male spriggan mesh by VectorPlexus for male characters. Fix for aspect carry weight integrated. Fixed the bug that causes different spells / armors to re-equip randomly. Torches now get re-equipped. 1H weapons on the left hand are still not supported. 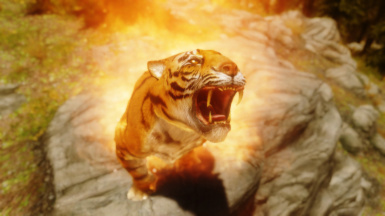 Changed the tiger's flame breath so that it does not affect multiple enemies. Tweaked stamina regen for each aspect. Frigid storm is now slightly more powerful. Nerfed the aspects a bit. Speed bonuses now have a cap value. Changed the cover for the Old Tome and the Falmer Sigils books. New splash image for the MCM. Enforced a delay when casting the transformation spells. Players are no longer able to instantly transform / revert repeatedly. You are now able to die and completely run out of stamina while in aspect form. If stamina runs out, you need to wait for it to replenish as otherwise you will not be able to perform any attacks. I have decided to remove this feature as it was choking the game with the use of the OnUpdate event. Added a new book called 'Tome of Knowledge'. This book is only useful for players who no longer wish to repeat the whole quest. This is vital for existing users of the mod as they will need a clean save to update. The book can be added via console by typing: help 'Tome of Knowledge' and using player.additem <item code>. Upon reading, it will trigger a script which will start each of the quests and complete them automatically. The whole process should take about 5 seconds to finish but since the objectives are being entered on your journal, they appear on the screen slower than the time it takes for the script to complete all the quests. Once the script is done, you will receive all the powers. Created a way for weapons and spells to be re-equipped when reverting back to original form. Backpacks from Frostfall should now also be removed and re-equipped. Shields, bows, crossbows, and two-handed weapons should also be fully compatible. The limitation here is that one-handed weapons equipped on the left hand do not get re-equipped. I do not understand why this is the case so if anybody knows how this works then please tell me and I will fix it. Also, the backpack from Frostfall will not show the axe, etc when it gets re-equipped. Players would need to equip the axe or something to that effect in order to refresh it. This is something that I cannot fix even further. Torches are also not supported. Added bonus to unarmed damage for each aspect and slightly improved health and damage resist bonus for all aspects. Nature's call will now always summon the maximum possible number of tree spirits. Limit is still set based on Alteration level. Added a poison visual effect on the Nature Swarm ability for better visual feedback. Your tree spirits are now immune to the Nature Swarm ability. Added a slider option on MCM for modifying the stat multiplier used for calculating the bonuses. The higher the value, the higher the bonus received by the aspects. Default multiplier is 1. Added a slider option on MCM for setting the maximum allowable number of tree spirits summonable. A value of 15 means that on 100 Alteration or higher, Nature's Call will summon 15 tree spirits. Default value is 8. Dynamic aspect bonuses implemented. Aspects increase their stats depending on the level and skill of the player. This is explained in detail under the Transformation Bonuses section on the mod page. Aspects now have their own armor rating and will only use 10% of the current armor rating the player has. If the player has 500 armor rating before transforming, then 50 will be added to the aspects armor rating upon transforming. Minimum level to start the questline is changed from 20 to 10. Refer to the recent updates section for more details. Fixed bug where the courier re-appears to deliver a duplicate letter to the player. Fixed bug where the quest doesn't progress after defeating the frost aspect and reading the Falmer Sigils book. The courier should now only deliver the letter when the player has finished the quest "Bleakfalls Barrow" and has attained a level of 20 or higher. Fixed bug preventing the mod to progress after reading the research journal. Revamped the transormation bonuses for all aspects. Renamed the spells to be consistent with new aspect names. Updated the cloak effects for the wolf, tiger and the bear. These also only activate when in attack mode. Transformation spells now truly last indefinitely. Before, the spells lasted for 100 days. Finally removed that blasted damage from the tiger transformation explosion. All aspect skills are now Alteration based. Aspect of Wolf, Tiger, Bear have been renamed to Aspect of Frost, Fire, Earth respectively. Aspect of Bear's cloak skill should now be resisted by armor. Frigid Storm and Blazing Inferno should not damage followers anymore although the explosion will still cause them to have a negative reaction. Frigid Storm has a new explosion effect and should now only freeze and damage enemies for 7 seconds. Returned the dust effect on the bear but a subtler version. Included a keyword on the nature aspect for compatibility with Frostfall. Fixed bug from 2.0 that made lesser spirits stay even when reverting from nature aspect form. Changed where aspect location reference alias points to which MIGHT fix random CTDs. This hasn't been confirmed but it's a better way to implement things anyway to avoid future incompatibilities. Corrected the word "Arcaneum" to "Arcanaeum" on the quest logs and objectives. Fixed issue with more than one aspect spawning. The inkwell, quill, and roll of paper objectives should only appear when the player does not have them. Updated frigid storm for the wolf aspect. Used better animations when transforming into the aspects. Fixed bug from version 1.7 that made the tree spirits not attack the player during the last trial. The bear aspect's left attack will now perform a dash that releases a shockwave to stagger opponents. Changed the animation the aspect of bear does when entering / leaving a transformation. The player's health is now averaged based on the remaining health the aspect had before going back to the original form. 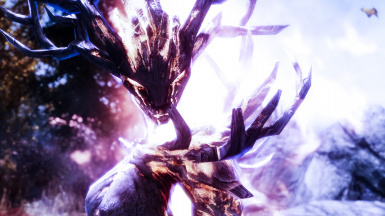 Removed blood decals / sprays on lesser tree spirits summoned and the nature form when hit. Players can now freely change races without fear of causing glitches when reverting back to original form. Fixed issue where new Nature aspect ability remains in the Spells List after reverting form. Changed how the quest handles saving the player's original race. Changed animation used for fiery strike and added a flame touch effect. Changed animation used for feral bite and added a frost touch effect. When holding down the right mouse button, the nature aspect will now cast the new Nature's Swarm ability. The Regrowth ability for the nature aspect is now cast by pressing the left mouse button. Lessened skill-up multiplier for Blazing Inferno and nerfed it a little bit. The journal tabs can now be accessed while in aspect form. Base magicka cost of transformation spells is now only 50. Re-balanced magic resistance across all forms (Magic resistance caps at 85). Further increased stamina regen for all aspects and reduced stamina cost of skills. Replaced the wolf's Icy Spear with a melee attack, Feral Bite. Replaced the tiger's fireball attack with a melee attack, Fiery Strike. No more time limit for transformations. Fixed issue with Aspect of Nature spell turning to a "Both Hands" spell instead of a "Voice" spell. Transformations now last 10 minutes. Added health and stamina regen to forms. Character will now not die when reverting to original form even if the player has taken too much damage in beast form. Increased the potency of the Regrowth spell a bit. Version 3.2. is released. New male spriggan mesh courtesy of VectorPlexus! Kindly refer to the latest updates section for a more detailed look on the list of updates for 3.2. Back up your save files before updating as I will not be held responsible for files getting messed up due to this. Enjoy! This mod is also available on the Steam Workshop! Watch Gopher and Gamespot's very own Cam & Seb doing awesome reviews of the mod. Thanks guys! Watch Brodual's and MMOxReview's excellent review of the mod! Thanks guys! Upon reaching level 10 and returning the Dragonstone to Farengar, a courier will deliver a letter to the player which triggers the quest "Lost Practices". This mod adds 4 transformation lesser powers in the Alteration school of magic to the player's arsenal. They are lesser powers which means that Alteration perks do not affect magicka cost. Alteration enchanted gear will reduce the magicka required to cast it though. Note: Pressing the "Shout" key anytime during a transformation will revert you back to your original form. Also, the jump actions for wolf and tiger both can serve as an attack. Aspect of Frost - This spell will grant the user access to the powers of the frost wolf. Left Click: Feral Bite - A melee attack with razor sharp teeth. Right Click: Frost Breath - A freezing breath attack. Left & Right Click: Frigid Storm - Sub-zero winds form three icicles that shoot down towards the target and impales it. 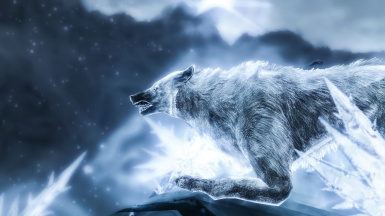 Aura: The frost wolf encases foes in ice hindering their movement. Passive: The frozen wolf is resistant to ice and more agile than any other form which gives it a bonus to movement speed. Also at higher levels (40 and above), the wolf freezes the path it walks on enabling it to walk on water. Aspect of Fire - This spell will grant the user access to the powers of the flaming tiger. Left Click: Fiery Strike - A melee attack with razor sharp claws. Right Click: Flame breath - A flaming breath attack. Left & Right Click: Blazing Inferno - The tiger generates intense flames around its body, scorching everything within the blast radius. Aura: Rising temperatures deals continuous fire damage against foes, making them more vulnerable to intense heat. Passive: The flaming tiger is resistant to fire and has more energy to unleash more havoc to its foes. Aspect of Earth - This spell will grant the user access to the powers of the earth bear. Left Click: Swipe Attack - A melee attack that inflicts Bone Break Fever. Right Click: Rapid Dash - The bear lunges forward which generates a shockwave to stagger opponents. Left & Right Click: Shockwave - The bear slams its paw on the ground dealing AoE damage. Aura: An aftershock that disables enemies eventually making them unfit for battle. 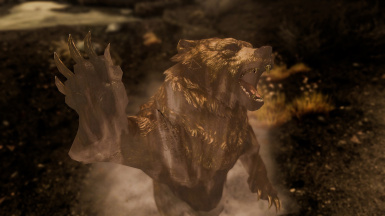 Passive: The bear has fortified health and damage resistance but has a severe penalty to magic resistance. Aspect of Nature - This spell will grant the user access to the powers of the healing tree spirit. Left Click: Regrowth - The tree spirit's health and stamina are healed for 10 seconds. Right Click: Nature's Swarm - The tree spirit focuses its magicka into a beam attack that deals magic damage. This skill spends magicka instead of stamina. Spacebar: Nature's Call - The tree spirit summons smaller tree spirits to aid in battle. Number of tree spirits summoned depend on Alteration skill. Each tree spirit summoned lasts 30 seconds. Note that the tree spirits have their essences bound to the player. Any damage dealt to them will inflict a portion of damage to the player. Aura: Healing Presence - The tree spirit heals nearby allies. Passive: The healing guardian has fortified magical resistance. The frost form's health, stamina, damage resistance, magic resistance, frost resistance, and speed improve as the player levels up. Moreover, each point in stamina increases each stat by a given amount. This means that characters who have a decent amount of stamina will have a slightly more powerful frost form. The fire form's health, stamina, damage resistance, magic resistance, fire resistance, and speed improve as the player levels up. Moreover, each point in stamina increases each stat by a given amount. This means that characters who have a decent amount of stamina will have a slightly more powerful fire form. Note that the fire form's speed bonus is inferior to the frost form's speed bonus. The earth form's health, stamina, and damage resistance improve as the player levels up. Each point in health increases each stat by a given amount. This means that characters who have a decent amount of health will have a slightly more powerful earth form. Note that the earth form gets a gradual penalty to magic resistance and will keep going down as you level up. On the plus side, the earth form has the most superior bonus on health and damage resistance among all aspects. The nature form's health, stamina, damage resistancem, and magic resistance improve as the player levels up. Each point in magicka increases each stat by a given amount. This means that characters who have a decent amount of magicka will have a slightly more powerful nature form. While the nature aspect only has average stats, it boasts the most magic resistance among the four aspects. Generally speaking the aspects are easy to defeat. It all depends on knowing what you're dealing with and what gear you're supposed to be equipped with. The spirit of the wolf is the weakest of the four aspects. It is obviously resistant to any type of frost power but equally vulnerable to fire. Pushing the wolf towards the water should also prove foolish as it can walk on water. In terms of gearing up you should be stocked with frost resistance potions and have some frost resistance enchanted gear. The spirit of the tiger is highly resistant to fire but equally vulnerable to frost. The tiger also is able to dish out an immense amount of damage very quickly while you're close to it so be sure to stay away and deal with it from afar. Be sure to bring fire resistance potions and enchanted gear. The spirit of the bear is greatly resistant to physical damage but luckily enough it has a weakness with magic. The bear has fortified physical attacks which means you should be always on the move and not let it get to you as much as possible. Gear with a high enough armor rating is vital to this trial. The spirit of nature is invulnerable to magic damage. It has no weakness plus it comes with three lesser tree spirits to aid her in battle. It is much more easier to have allies to fight with you as the battle could get out of hand pretty quickly. Gear up with magic resistance and a good armor rating is also necessary for this trial. Sometimes the wolf, and bear reportedly glitches when running through walls and will enable you to pass through them. The Grandmaster - True Unarmed and Unarmored Combat mod by leecarter is incompatible as it causes players to have their health reduced every time they transform. There seems to be a conflict as to how much health should be returned to the player. It has been reported that the aspect of earth has an issue with the Requiem mod as it causes the movement speed to drastically drop to the point that you're not able to move. The enchantments on equipment do not get re-applied when the equipment are re-equipped. I've found that this is a vanilla issue and I do not know if there is a workaround to make this work properly. If anyone knows how to re-equip items without losing enchantments let me know. It has been reported that BodyTypes 2.0 sometimes causes the aspects' models to be invisible. Note: Back up your save files before updating! Existing users should use a clean save before updating! Important: This update has the carry weight fix integrated so the optional ESP file is no longer necessary. Please delete that file before installing this update. Big thanks to Muppetpuppet for publishing the sabre tiger texture as a mod resource. 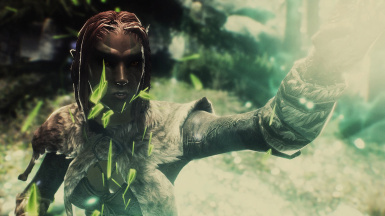 He is also responsible for one of the best quest mods out there - The Moonpath to Elsweyr.